A good cigar humidor will keep your cigars fresh, flavorful and ready to smoke, no matter where you live and what the humidity level might be. As such, it’s an essential accessory if you enjoy a good cigar and have a growing cigar collection. Cigar humidors come in a variety of designs and sizes, ranging from small desktop humidors to high-end humidors with internal shelves and digital hygrometers. They’re available with a range of prices, from the ultra-affordable to the lavish and expensive. Since your humidor is responsible for keeping your cigars fresh and ready to smoke, it’s more of an investment than it is a purchase. Invest in a good humidor, and you’ll enjoy a more satisfying, fulfilling smoke from your cigars, as well as a much lower risk of your cigars getting damaged. To make the process of buying your humidor easier, we’ve put together a detailed guide to the best cigar humidors on the market. Our recommendations range from small humidors to larger models that can hold upwards of 120 cigars at once. You can find our full humidor reviews and comparisons further down the page. Below, we’ve put together a detailed checklist of features that you should look for in a humidor to help you get the best quality product at the best possible price. A good humidor needs to have five features: an airtight seal, a cedar interior, accurate humidity measuring equipment, an effective humidifier, and enough space to comfortably store your cigar collection. Below, we’ve provided a full explanation of why each feature is so important. Humidors keep your cigars fresh by absorbing and retaining humidity, typically from a humidifier pack or humidity tube. If your humidor doesn’t have a tight seal that stops air and moisture from escaping, it won’t be able to maintain a steady humidity level. If your humidor doesn’t have an airtight seal, you’ll notice the humidity level slowly decreasing as moisture escapes, even if the lid is firmly closed. This can result in your cigars becoming too dry to smoke, potentially ruining your collection. Even the best humidors will occasionally have seal problems, mostly due to small defects that can occur in manufacturing. We recommend checking your humidor before you use it. You can do this by turning on a small flashlight and putting it inside the humidor. Close the lid and check if any light escapes from the humidor. If the light shows obvious gaps between the lid and body, it could have a bad seal. An airtight (or at least almost airtight) seal is essential for a humidor to work properly. If you’ve bought a humidor and its seal is broken, we recommend returning it for a new replacement to ensure your cigars remain fresh and aren’t affected by a lack of moisture. The best humidors all have an interior made of the same wood: Spanish cedar. This type of cedar is famous for its ability to absorb and retain moisture. It’s also a well-known repellent that stops pests such as tobacco beetles from hatching and multiplying inside your cigars. If you’re shopping for a cigar humidor, check that it has a Spanish cedar interior. For travel cigar humidors, check that it at least has a partial Spanish cedar lining. Humidors fitted with Spanish cedar are far more effective at retaining moisture than models fitted with other materials. The vast majority of humidors are equipped with a hygrometer — an instrument designed to measure and display the level of humidity inside the humidor. Using a hygrometer, you can “season” your humidor to a certain humidity level (usually 65-73%) and check that it maintains this level. Some hygrometers are pre-calibrated and accurate from the factory, while others need to be set up manually. You can find out more about how to calibrate a hygrometer in our guide to storing cigars inside a humidor. For a humidor to keep your cigars fresh and flavorful, it needs to have a constant source of moisture. Humidifiers (also known as “humidity packs” and “humidity tubes”) keep your cigars at the ideal humidity level by continually supplying fresh moisture. Some humidors come with pre-installed humidifiers, while others are sold without any source of humidity. Since humidifiers need to be replenished and replaced over time, you’ll need to keep a supply of humidity packs or distilled water at home to use in your humidor. Humidors come in a variety of sizes, from compact travel humidors that can fit five cigars or less to large humidors designed to hold as many as 500 cigars. Many cigar enthusiasts build custom humidors capable of holding thousands of cigars at once in a fresh, humidified environment. There’s no “best” size for a humidor. However, a good rule is to order a humidor that can hold at least double the amount of cigars you typically keep at any one time. This means you’ll have the right amount of room to grow your collection without having to invest in a new humidor too soon. With its gorgeous exterior and Spanish cedar interior, the Mantello 100 Cigar Desktop Humidor Glasstop is a classy humidor aimed at enthusiasts. This humidor has a maximum capacity of up to 100 cigars and a completely transparent glass top for improved visibility. Holds up to 100 cigars in four compartments, making it ideal for enthusiasts with mid to large cigar collections that vary in size, taste, and country of origin. This humidor is completely lined with Spanish cedar to retain moisture effectively and repel common pests, such as tobacco beetles. Includes a removable cedar tray with center divider, allowing you to spread your cigar collection over two levels. Solid and sturdy, with durable brass hinges and a matching brass lock and key set. This is a well-made humidor that’s built to last. Mantello Cigars have given this humidor a gorgeous high gloss finish that’s sure to earn plenty of attention and compliments. Glass display window lets you view the top layer of your cigar collection without opening the humidor, preventing any loss of moisture. The Mantello 100 Cigar Desktop Humidor Glasstop is a mid-sized humidor with a premium high gloss exterior. With enough space for 100 cigars, this humidor is large enough to store the vast majority of cigar collections in a fresh, secure environment. This humidor has all of the standard features you’d expect in a mid-sized humidor. You’ll find an analog hygrometer on the front, as well as a matching brass lock and key set. The interior of the humidor is split onto two layers, both of which have a center divider to help you sort your cigars. This is a glasstop humidor with a large display window, allowing you to see your cigars without having to open the lid. The exterior is natural wood with a beautiful coat of high gloss polish to give this humidor a rustic, elegant look. Thanks to its large display window, gorgeous high gloss exterior and brass hardware, this is a stylish humidor that stands out from the crowd. It’s also very good from a functional perspective, with more than enough space to hold a typical cigar collection. Like most glasstop humidors, a small percentage of units models of the Mantello 100 have seal issues that result in moisture leaking out. Because this humidor is sold on Amazon, it’s easy to replace your humidor in the event that you receive a unit with a leaky seal. Because this humidor doesn’t include a humidifier, you’ll need to purchase a pair of humidifier tubes to keep inside. The Mantello 100 Cigar Desktop Humidor Glasstop is a stylish, high quality humidor that mixes great looks with the exact functionality a demanding cigar enthusiast expects. With space for a collection of 100 cigars, this is a mid-sized humidor that can fit on a work desk or bookshelf. If you’re looking to upgrade from a small cigar case to a larger capacity humidor, the Mantello 100 is a great choice. The Prestige Import Group Valencia Glass Top Humidor holds up to 120 cigars, putting it right in the mid-sized humidor category. With small display windows on its front side and lid and a sleek high gloss finish, this is a beautiful humidor that offers a great mix of looks and performance. Holds up to 120 cigars at a time, with five separate interior compartments to allow you to sort your cigars by size, taste or country of origin. One top and two front display windows, letting you look into the humidor without having to open the lid and release moisture. Includes a lock and key set for safe cigar storage, as well as recessed side handles for simple portability. The interior of this humidor is fully lined with Spanish cedar to retain moisture and repel tobacco beetles. This humidor is available with an analog hygrometer or, for a slightly higher price, a more accurate digital hygrometer. Both hygrometer options are mounted on the front section of the humidor and are readable from outside. At 14¾ inches by 9¼ inches, this humidor is larger than most desktop humidors but still compact enough to comfortably fit on your work desk, side table or bookshelf. The Prestige Import Group Valencia Glass Top Humidor is a mid-sized humidor with plenty of space and five separate storage areas, allowing it to hold up to 120 cigars at full capacity. This is a great humidor for cigar enthusiasts looking to upgrade from a small desktop cigar case. The interior of this humidor can be split into two layers using the removable cedar tray. The tray has two adjustable dividers, allowing you to split it into three separate areas to arrange cigars by size, country of origin or other characteristics. A small humidifier is mounted on the underside of the lid, with a hygrometer on the front side of the humidor. One huge advantage of this humidor is that it’s available with a digital hygrometer, which prevents the possibility of inaccurate readings. The Valencia humidor has two front display windows and a larger window on the lid, letting you see in without having to open the humidor and risk losing moisture. This humidor’s mix of size, elegant looks and function make it a great buy for anyone with a mid to large cigar collection. Like all wooden humidors, a small percentage of Valencia humidors have seal issues that stop them from holding humidity. Because this humidor is sold on Amazon, it’s easy to return a bad unit for a replacement in the small likelihood that your order is affected. The Prestige Import Group Valencia Glass Top Humidor is a great humidor for cigar enthusiasts with medium-sized collections. It’s small enough to store on a work desk or bookshelf but offers enough storage space to hold the vast majority of cigar collections without feeling too cramped. This is an excellent looking humidor that not only does what it’s supposed to do but looks great while it does it. If you’re looking for a premium humidor that blends aesthetics and function, the Prestige Import Group Valencia Glass Top Humidor is worth consideration. The Versailles 100 Cigar Glass Top Humidor is a stylish, mid-sized cigar humidor from Quality Importers. With three exterior windows, space for up to 100 cigars and a removable cedar tray for simple organization, this is a premium cigar humidor designed with enthusiasts in mind. Holds up to 100 cigars, with three internal compartments to sort your cigar collection by size, taste or country of origin. Features three tempered glass panels, allowing you to see the top and bottom contents without opening the lid. Quality Importers fit this humidor with elegant brass hardware, ranging from the hinges and hygrometer housing to a lock and key. Fitted with a full Spanish cedar interior and removable cedar tray to retain moisture and repel tobacco beetles. This humidor has two recessed brass carry handles, making it easy to carry around and move from one location to another. Large enough to hold up to 100 cigars but small enough to easily carry around your home, the Quality Importers Versailles 100 Cigar Glass Top is a mid-sized cigar humidor that looks great, works well and has enough space to store a typical cigar collection. This humidor has a full Spanish cedar interior and includes a removable tray, letting you divide your cigar collection over two levels. There’s also a vertical divider in the bottom of the case to give you three separate storage areas. Quality Importers have fitted this humidor with recessed carry handles, making it easy to carry and transport. All of the hardware, from the hinges and handles to the hygrometer housing, is made from brass. This humidor includes a built-in hygrometer and humidifier, although neither are outstanding. It also has three small windows — two on the front and one on the top of the humidor — allowing you to view your cigar collection without opening the lid. Like most desktop humidors, the hygrometer fitted to the Versailles has some accuracy issues even after it’s been calibrated. The standard humidifier is also somewhat on the small side and isn’t recommended if you plan to fill the humidor to capacity with 100 cigars. These are common desktop humidor issues that don’t only affect the Versailles humidor. As with many humidors that feature glass display windows, the Versailles slowly lets out moisture and is best monitored every few days to make sure your cigars don’t become overly dry and aerated. All in all, the Quality Importers Versailles is a good humidor that works very well, provided you’re willing to replace the included hygrometer and humidifier. Thanks to its reasonably large storage capacity, this humidor is ideal for enthusiasts that want to upgrade from a small desktop case. With space for up to 120 cigars, the Prestige Import Group Monte Carlo Humidor is perfect for cigar enthusiasts with growing collections. This humidor features a removable cedar tray and a pair of side handles for better cigar organization and simple portability. This humidor has four internal storage compartments with a total capacity of up to 120 cigars. Using the cedar tray, you can easily sort and organize your cigars by country of origin, size or flavor profile. A built-in humidifier and analog hygrometer are included, both of which are fixed to the underside of the lid. Made from solid wood with an elegant cherry exterior and high-gloss finish that matches most wooden furniture. The interior of this humidor is fully lined with Spanish cedar to keep your cigars fresh and retain moisture. This humidor has two side carry handles, making it easy to move even when filled with a large cigar collection. At 15 inches in width by 10 inches in depth, this humidor is big enough to store a sizable cigar collection while still fitting comfortably onto a work desk, side table or bookshelf. If you need more space than most desktop cigar humidors can offer, the Prestige Import Group Monte Carlo Wood Cigar Humidor is a great choice. This mid-sized humidor has enough space to hold up to 120 cigars, with four compartments to make organizing your collection easy. 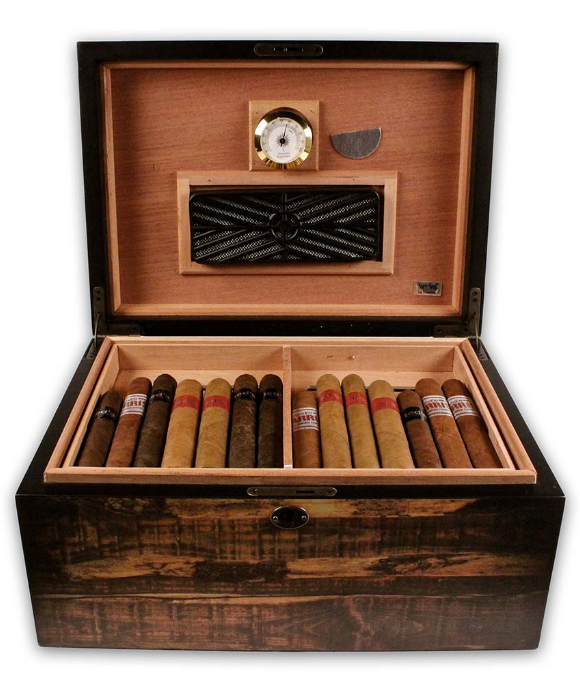 Prestige Import Group have designed this humidor with a great level of attention to detail. The interior is fully lined with Spanish cedar to retain moisture and keep your cigars ready to smoke, with a removable Spanish cedar tray for easy access and storage. This humidor does not have an external hygrometer. Instead, the hygrometer and humidifier are fixed to the bottom of the lid. This gives the exterior a clean, uninterrupted look but means you’ll need to open the lid to check the humidity level. Thanks to its side carry handles, this is a very easy humidor to move around the home. Despite holding up to 120 cigars, it’s also small enough to fit on top of most desks and side tables, or on a large bookshelf. Like many other humidors, the hygrometer included with the Monte Carlo Humidor isn’t always accurate and should be replaced if you plan to store your entire cigar collection inside. It’s also worth replacing the standard humidifier with a third party humidity pack. A small percentage of Monte Carlo humidors have seal issues that prevent them from holding humidity properly. Since this humidor is sold on Amazon, it’s easy to replace in the event that you receive a unit that doesn’t have an airtight seal. This is one of the best humidors available for cigar enthusiasts that need to house a mid-sized collection. It looks great, holds humidity well and includes a removable tray to help you sort and organize your collection. If your cigar collection has outgrown your desktop humidor, this is an excellent upgrade. Just be prepared to replace the built-in hygrometer and humidifier to make sure your cigar collection has the humidity it needs to stay fresh and full of flavor. Designed for travelers, the La Cubana Genuine Leather Cigar Humidor is a high-quality portable cigar humidor that combines elegant looks with a full set of cigar tools. This compact humidor is an excellent choice if you like to carry your cigar collection with you while you travel. Made for cigar enthusiasts who travel often, this portable humidor can hold 15 cigars at once, allowing you to carry a reasonable collection with you on vacations and business trips. This humidor is fitted with a small leather and velcro strap to hold your cigars in place and prevent them from rolling around while in transit. Includes a full set of cigar tools, from a humidifier and hygrometer to a cigar cutter, all of which are located on the underside of the case lid. 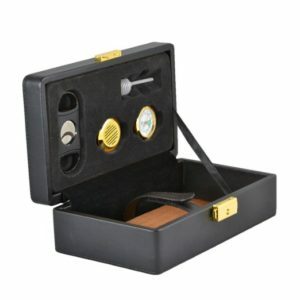 This humidor also features a lock and key set to keep your cigars safe as you travel. Felt interior lining and Spanish cedar bottom sheet to absorb moisture and maintain the optimal humidity level at all times. The smooth black leather exterior gives this humidor an elegant, premium look that matches most briefcases and luggage sets. The La Cubana Genuine Leather Cigar Humidor is a small humidor designed with portability in mind. Aimed at cigar enthusiasts who travel for business or pleasure, this portable cigar case is large enough to store up to 15 cigars at once in a felt and cedar-lined interior. This humidor has several unique features that set it apart from other travel cigar cases. The first is a leather and velcro strap, which holds your cigars in place and prevents them from moving in the case while you travel. The second is its cigar tools, which includes a hygrometer, humidifier, and cutter. These come in handy on the road and allow you to travel without having to bring extra humidity packs and other cigar accessories. Despite its small size, this humidor has a cedar bottom lining that holds moisture and prevents your cigars from becoming overly dry. The sides of the case are lined with felt to prevent your cigars from damage if they move inside the humidor. If you’re a cigar enthusiasts that travels often, you’ll appreciate this humidor’s stylish design and a great set of tools. The only major disadvantage of this humidor is its interior build quality. While the felt is attached to the sides of the case very well and the case itself feels solid, the cedar lining is glued in rather roughly and feels loose on some units. If you travel often and like to bring your cigars with you, the La Cubana Genuine Leather Cigar Humidor can enhance your trips and help you avoid dividing your cigar collection into several smaller portable cigar cases. Although the cigar cutter and other tools aren’t perfect, they’re good enough to do the job while you’re on the road. All in all, this is a great cigar case for long-term travelers that enjoy a smoke and don’t want to purchase new cigars locally. Designed for beginners and cigar enthusiasts with small collections, the Quality Importers Desktop Humidor holds 25 to 50 cigars. This humidor has a glass display window on its lid, letting you view your cigar collection without having to open the lid. Holds between 25 and 50 cigars, making it perfect as a beginner humidor or as a second humidor for a cigar enthusiast. This humidor is available in five different colors, from natural brown to blue, black, white and red. Because of its display window, this humidor allows you to check on your cigar collection without having to open the lid and let moisture escape. Includes gold-plated hinges and hygrometer housing, which are rare on affordable cigar humidors. Fitted with a full Spanish cedar lining to keep your cigars fresh and ready-to-smoke at any time. The Quality Importers Desktop Humidor is a small cigar humidor aimed at beginners interested in cigar smoking and enthusiasts in need of a second humidor. With enough space for 25 to 50 cigars, this is a compact humidor that will comfortably fit on your side table or work desk. This humidor has a simple design without any trays or shelves. Inside, there’s one small divider that allows you to sort your cigar collection into two compartments. This makes it easy to set up your cigar collection by taste, size, country of origin or other characteristics. 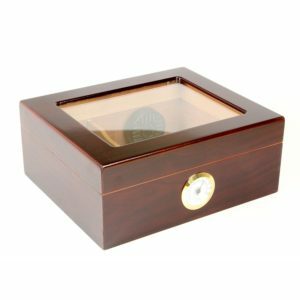 Quality Importers manufacture this humidor with a full Spanish cedar lining to hold humidity and repel tobacco beetles. This humidor holds humidity well and requires little maintenance once it’s seasoned and set up. If you have a small cigar collection that you’d like to house safely, the Quality Importers Desktop Humidor is a great choice. Thanks to its great looks and affordable price tag, this is an excellent option for beginner cigar hobbyists. Because this is an affordable humidor, it’s slightly light on features. There’s no removable tray or digital hygrometer, although these missing features are understandable considering its compact size and affordable price tag. The Quality Importers Desktop Humidor is an excellent humidor for beginners. Because of its small size, it comfortably fits on most work desks, side tables, and bookshelves. It looks elegant and perfectly matches most natural, unfinished wooden furniture. If you’re looking for an affordable humidor to hold your small cigar collection, this is one of the best choices available. Once properly seasoned, it holds humidity well and will keep your cigar collection fresh, properly humidified and ready to smoke.